Update on October 24, 2016: On October 6, 2016, the Massachusetts Appeals Court upheld the Superior Court’s decision to dismiss our case (read the decision here). The Court’s opinion is a disappointing failure to engage with the urgent problems of climate change and climate justice. As we have argued from the beginning, powerful institutions like Harvard University have a moral and legal duty to end their financial support of the fossil fuel industry. Short-term profits cannot justify the spread of scientific falsehoods, the corruption of the political process, and endless production of dirty fuels that stands in the way of a clean energy future. Our courts must defend the public interest in a healthy climate and recognize the duty of investors and governments to curtail carbon emissions. Today, despite the strength of our legal arguments in favor of divestment, the status quo prevailed over judicial imagination. One of our plaintiffs has filed an application for further appellate review. All plaintiffs have faith that the global divestment movement and other climate legal actions will prove stronger than the intransigence of established interests and that a more just vision of climate rights and responsibilities will prevail. The Harvard Climate Justice Coalition stands with all others, including the striking workers at Harvard’s dining halls, who seek to build a better world by holding our powerful institutions accountable. Update on May 31, 2016: Next Tuesday, June 7, members of the Harvard Climate Justice Coalition will appear in the Massachusetts Appeals Court for oral argument. All are invited to attend the argument and lend support! We packed the courthouse full of supporters at our last hearing and hope to do so again. Check out our News & Updates and Court Documents pages for more information! Also check out a recent article in the Columbia Journal of Law and Social Problems about the lawsuit. 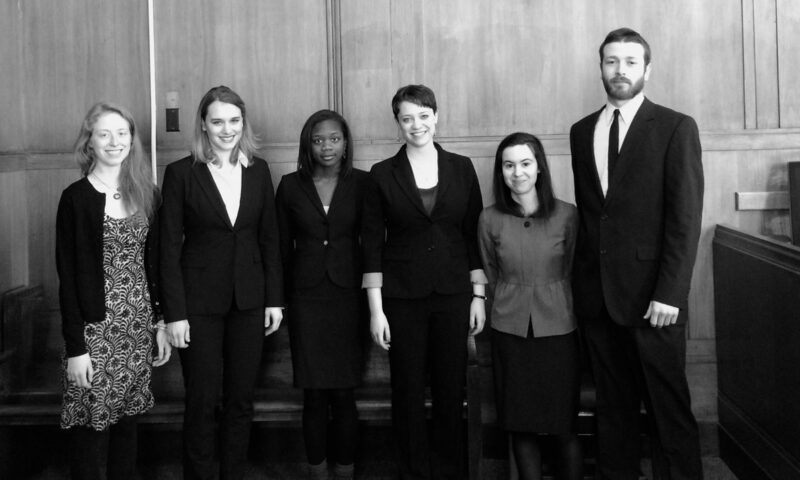 Cambridge, MA – On June 7th, Harvard students and recent graduates will present oral arguments in the appeals stage of their litigation over the Harvard Corporation’s investments in fossil fuel companies. The plaintiffs, who are members of the Harvard Climate Justice Coalition, filed their lawsuit against the University’s governing board in November 2014. They argue that the investments harm students and future generations, violating the University’s public charitable duties and other legal duties. Last year, however, a state trial court granted the Corporation’s request to dismiss the legal action, focusing on the student plaintiffs’ alleged lack of standing to challenge decisions made by the University leadership. The students have appealed and will present their arguments to the Massachusetts Appeals Court on Tuesday. The students, who have represented themselves throughout the litigation process, will argue to the Appeals Court that the dismissal was erroneous on both procedural and substantive grounds and that the case should have been allowed to proceed. A decision in the students’ favor would give them the opportunity to substantiate their claims before the trial court. The lawsuit has drawn attention and support from outside the University. Prominent climate scientist Dr. James Hansen and the Animal Legal Defense Fund both filed amicus briefs in support of the students’ effort,and the Cambridge City Council expressed its support for the lawsuit in a resolution that passed unanimously in September 2015. Since the filing of the lawsuit in November 2014, following years of the Corporation’s refusal to engage students on fossil fuel divestment, litigation has been used more frequently to address harms caused by climate change. In the Netherlands, for example, a court recently ruled that that country’s government was legally required to take meaningful action on climate change, including regulations to reduce emissions of greenhouse gases. In the United States, young people have invoked the public trust doctrine to argue that government regulatory agencies are legally obligated to address climate change harms. Cambridge, MA – Students continued their legal fight to compel Harvard University to divest its endowment from fossil fuel companies this week, filing an appeals brief for their landmark lawsuit in the Massachusetts Appeals Court. Their latest effort has garnered high-profile support in the form of amicus briefs from prominent climate scientist James Hansen and from the Animal Legal Defense Fund. The students also have support from the City of Cambridge, where Harvard is located. The students argue that Harvard’s investments harm students and future generations, violating the University’s public charitable duties and other legal duties. Harvard University has defended its investments in fossil fuel companies whose business activities contribute to climate change. In March 2015, a trial court judge accepted the University’s arguments and dismissed the students’ case. The students are appealing that decision and asking for the opportunity to make their arguments at trial. The Harvard Climate Justice Coalition filed its lawsuit in November 2014, after the Harvard Corporation refused for years to engage students on using divestment to combat climate change. The lawsuit sets a precedent for the global fossil fuel divestment movement as well as for litigation to address harms caused by climate change. In a document filed with the trial court, the Harvard Corporation conceded that Massachusetts law requires nonprofit organizations to consider how investment decisions relate to their charitable missions. However, it asserted that supporting fossil fuel companies–whose business activities cause climate change–is consistent with its stated mission to promote the advancement and education of youth. The Corporation argued it has broad latitude to invest in any industry so long as it is profitable and that all such decisions should be shielded from judicial scrutiny. Cambridge, MA – A Massachusetts trial court sided with the Harvard Corporation on Thursday and dismissed a lawsuit that seeks to compel the University to divest fossil fuel holdings from its $36.4 billion endowment. The suit, brought by Harvard students, alleges that Harvard’s financial support of gas, oil, and coal companies contributes to climate change, harms Harvard students’ education, and damages the interests of future generations. The students say that they plan to appeal the decision. In granting the Harvard Corporation’s motion to dismiss, the court focused on students’ alleged lack of standing to challenge decisions made by the University leadership. The court recognized the exceptional harms caused by climate change but concluded that Harvard’s decisions should be free from judicial scrutiny in all but the most exceptional circumstances. While praising the students’ “fervent and articulate and admirable” advocacy, the court’s opinion ruled out state courts as the appropriate forum for relief. Additionally, the court found that the students were prohibited from arguing on behalf of future generations because of special rules of procedure. The judge indicated, however, that the state’s highest court should weigh in on the matter, paving the road for an appeal. The decision comes in the midst of an escalating divestment campaign on Harvard’s campus. Last April, University police arrested a student during a blockade of the campus’ main administration building by divestment supporters. In February, over 30 students demanding divestment conducted a sit-in near the Harvard president’s office. In recent weeks, a long list of alumni including Bill McKibben, Cornel West, and Archbishop Desmond Tutu have announced support for a week-long civil disobedience campaign set to begin April 13 on the University campus. The lawsuit, which seeks a court order compelling Harvard to sell off its investments in fossil fuels, is the first of its kind in the rapidly growing divestment movement. The Harvard Corporation has steadfastly maintained that its fossil fuel investments are consistent with its educational mission, even while refusing requests from students and faculty to have an open meeting on divestment. The student plaintiffs said they plan to appeal the decision, and expect a higher court to rehear their case in the coming months.